For centuries, asbestos has been used in building projects all over the world. Convenient, strong and heat-resistant, it is a naturally-occurring substance – with fatal effects. Today the HSE estimates that there are 3500 cases of asbestos-related illness every year in Britain. We look at the real risks and find out where to get advice on handling asbestos at work. Asbestos is known to be present in more than 500,000 buildings in the UK, and every year around 1,000 people die from exposure to it. The material was extremely popular in construction between the 1950s and 80s, a real growth period for big cities and business buildings. If a building pre-dates 2000, it is likely to contain asbestos or asbestos-containing materials, which include steel frames coated with asbestos. Asbestos can be found anywhere in a building. It was commonly incorporated in textured coatings, cement products, floor tiles, textiles, lagging, insulation boards, and composites. You might find these on the inside of the building (such as ceiling panels, wall coatings, and pipe insulation) or outside the building (such as cement panels). Asbestos is only dangerous when disturbed, so don’t panic unnecessarily if you find some. If you own a shared or business building, managing asbestos is legally your responsibility. It’s advisable to commission a survey and keep the results on an accessible record for future use. If your building was built before 2000, you should assume that it contains asbestos somewhere. Check surveys and building reports for evidence; if you can’t trace anything, look around the building for materials that could contain asbestos. Make a note of things like insulating board or pipe insulation, ceiling boards and textured coatings. You can have these tested (choose an accredited company to do this). You only need to remove asbestos if it’s degrading or it’s part of something that has to go anyway. In fact you are advised not to disturb asbestos that’s in good condition. It is harmful when the fibres are exposed or disturbed, and not before. If you do need to have work done, be careful in your choice of contractor. The Health and Safety Executive lays out specific guidelines for contractors working with asbestos. Only people trained to manage the associated dangers are permitted to handle certain asbestos materials, including pipe insulation and sprayed asbestos. You can find a directory of contractors on the HSE website. 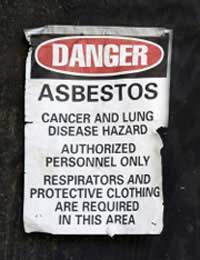 For other asbestos materials, ensure that you hire a contractor who has asbestos training. Trained asbestos workers will know how to minimise disturbance and dangers. This includes precautions such as keeping surfaces slightly damp (to reduce airborne fibres) and keeping a vacuum cleaner running to continually remove dust particles. Power tools are inadvisable and workers will also wear disposable overalls, a well-fitting mask, and boot covers. Finally, the workers will decontaminate themselves, wiping disposables with a damp cloth and putting them into a sealed bag, labelled as asbestos waste. Information about asbestos licensing and training is available from the Health and Safety Executive website, or your local office.